Coffee cup rides is a rotating amusement equipment, is the market common small and medium-sized children's play equipment, playgrounds, parks and other places of play can see the rotating coffee cup rides figure, exquisite appearance and interesting way of operation are for the coffee cup rides To the unexpected popularity, the device can be described as a history of pleasure.On a classic invention, even now there are many similar products on the market like rotating cups, such as Bear Bear, Vini Bear Bear Cup rides products, but the These products have inherited the essence of the rotating coffee cup rides, in different forms in our lives. Coffee cups rides to the shape of the United States and the coffee pot with a coffee cup as the theme of design ideas, coffee cups rides around the colorful coffee pot revolution at the same time, passengers sitting in the coffee cup rides can also turn the coffee cup in the steering wheel rotation, speed adjustable The After the start of the device rotation, the turntable above the coffee cup rides can control about 360 degrees rotation, giving a dizziness to stimulate the entertainment experience. Equipment modeling novel and beautiful, no matter where they are a beautiful landscape. 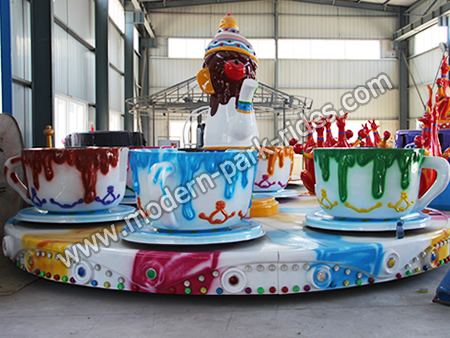 Coffee cup ride is a kind of classic rotate amusement ride that is characterized by cup-style spinning vehicles with a turntable-like floor, which is becoming more and more popular. The tea cup rides belong to a low to medium speed ride with expected changes in elevation and speed. The design is new and attractive. It is really welcomed by the old and the young. Generally, the amusement tea cup rides consist of 6 or 9 cup cockpits. When the whole tea cup ride spins, each cockpit of the rides can be rotated by the whole machine. At the same time, riders on the tea cup rides can handle the central steering wheel. The speed of the tea cup ride rotation can be maximized particularly, so the riders can get the most fun, thrill and happiness. 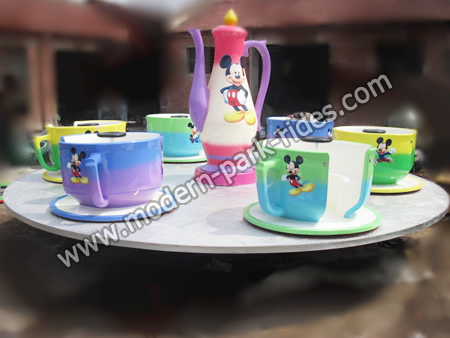 Tea cup rides are widely seen in amusement park and outdoor playground and there are various styles in Modern Amusement Group, such as tea cup rides, coffee cup rides, flower tea cup rides, and so on. Bone china cup good insulation, can keep the temperature in the cup of coffee, but a high Ferris Ring Ride; double stainless steel cup ultra insulation, durability will not be worn, bone china coffee prices are slightly better, but the lack of aesthetics . In recent years, must be hot to drink coffee concept cup kids bumper cars and even with this stress, the development of effective insulation pottery cup, even better than the porcelain cup bone china cup, use this texture containing animal bone ashes in the cup, you can make coffee in the cup temperature decreases slowly. However, due to its expensive price a lot more than the previous two, it is rare compared with general household use, only to see more attention to the cafe to get. The most basic one, and coffee mugs are definitely not from a chemical reaction, so the active metal is definitely not do coffee mugs (Of course, if you want to pursue alternative taste also) such as aluminum cup. Coffee cup mug to thick, the cup is not wide Tea Cup Ride the sheets, hot cup of coffee makes cohesion and difficult to cool quickly, without affecting the taste and smell of coffee. Just drink a cup of coffee, is a Jellyfish Rides of course. But to a good cup of coffee, in addition to well-baked and sophisticated operating skills, coffee mugs also serves as an extremely important role. Coffee liquid amber color and very clear. So in order to show up this park trains coffee, preferably with a cup of white coffee cup. Some ignore this problem in the production of various colors in a coffee cup on the inside, and even the practice of depicting the complex pattern of thin, often make it difficult to distinguish the case from the color of coffee and coffee-making done. Conventional coffee cup can be divided into three kinds. The third is no chassis approximately ml of milk cup mug coffee cup and France used. Of course, for coining some of the beautiful and nice fancy coffee, also used a variety of glass goblets, beer cup. But not in the pure coffee cup. Red cup: To make tea fragrance can spread, and convenient to enjoy tea color, red cup generally shallow bottom of the cup, the cup mouth wider, higher light transmission. The difference between the red cup Although red cup with coffee cup Roller Coaster, but from the shape, size, and to determine the difference between red cup coffee cup.